Morgan Motor Company is a family-owned car manufacturer based in Pickersleigh Road Malvern that hand-builds iconic British sports cars, famous the world over for their unique blend of craftmanship and charisma married with innovation and cutting-edge technology. The Company was established in 1909 by H.F.S. Morgan with the design of the now iconic Morgan Three-Wheeler. This was followed in 1936 by the Morgan 4-4, which continues to be produced today, and is the longest running production car in the world. Every Morgan is expertly crafted using three high quality core materials: ash, aluminium and leather coupled with the latest drive-train technologies Each Morgan is truly unique, being hand-built to the highest standard by passionate and skilled craftspeople, whether it be the lively classic sports car, (including the 4/4, the Plus 4, the Roadster and the Plus 8) or the extravagant high performance Aero 8 ( Aeromax, Aero SuperSports or Aero Coupe) or the truly unique and characterful Morgan 3-Wheeler. In 2011, after an absence of over 50 years, Morgan re-introduced the Morgan 3 Wheeler, a modern interpretation of H.F.S. 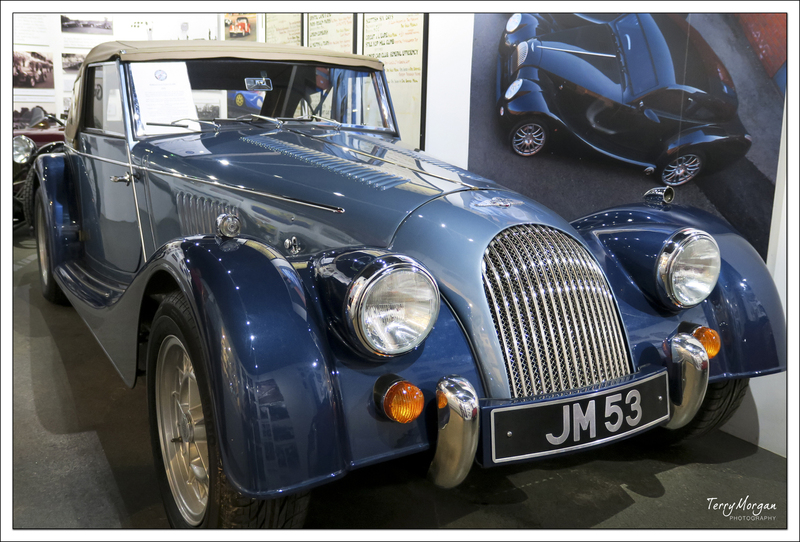 Morgan’s classic design. Based on that popular 3 wheeler, Morgan’s first production electric vehicle, the EV3, was launched at the Geneva Motor Show in 2016. Prospective owners are encouraged to visit Morgan’s Pickersleigh Road factory to watch their car being built and to choose from a wide range of paint and leather-trim options, along with the extra details that make each Morgan unique to its owner. If you are not either an existing or prospective owner, you might well be tempted once you have enjoyed the informative and informal tour through the workshops where history has been made. I can vouch for the fact that you do get to feel the spirit of the place as you walk around. Being a Morgan myself did strangely add to the enjoyment of the visit and the feeling of pride that the name is associated with such a charismatic product, even though there is regrettably no known direct family connection. I hope that the slideshow of my photographs captures some of the feeling of somewhere British thoroughbred performance and classic design comes together. Feel free to drop be a reply or a comment. Nice photos Terry, you captured the spirit of the place. I think your guide was better than ours!